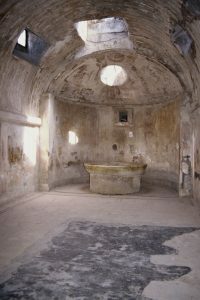 The men's calidarium, or hot bath, of the Forum Baths was heated by a system of double walls and hollow floor, which provided circulation of hot air and steam. The vaulted ceiling has ribs which radiated the heat inward. The large, cold water basin shown in this photo is in excellent condition. It has inlaid bronze letters proclaiming who paid for it and what the cost was.